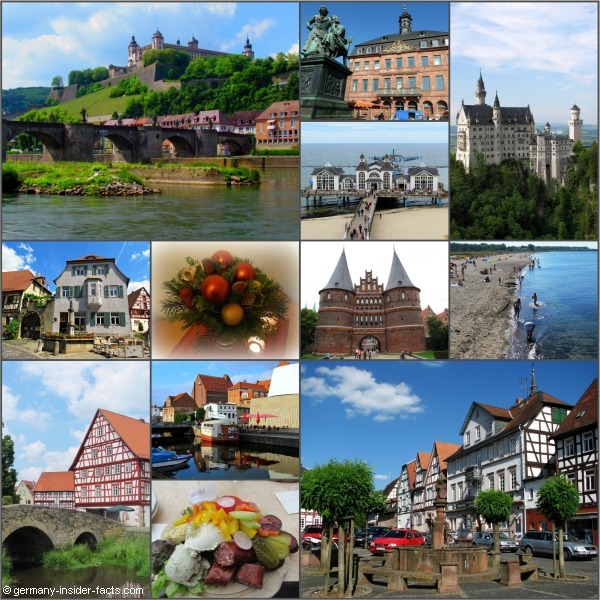 Welcome to the "Germany Facts Newsletter", packed with great information about Germany. Actually, I thought to name my e-zine the "The Litfaßsäule" but I guess the name is not very common outside of Germany. Now, are you curious what I am talking about? 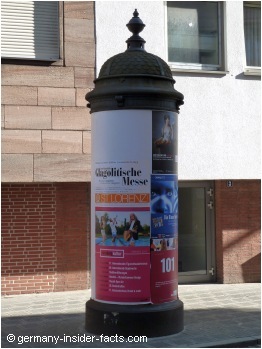 A Litfaßsäule is an advertising column, invented by the German printer Ernst Litfaß in 1854. You would think this is a thing from the past, however, the Litfaßsäule is still used by local advertisers in the 21th century, despite internet and social media. No worries, you don't have to pay when you subscribe to my newsletter, it is totally free. All I am going to "advertise" is the beauty of my country. Don't worry, I won't spam your email box with daily mails! You can expect an email every couple of weeks, not more than one per month. And no, I won't write book-like novels, the newsletters will be short and easy to read. There is the new European privacy law (GDPR) coming into effect on 25. May 2018 to protect personal data of people in the EU. --- Let me tell you, I don't make any difference where you come from. I respect everyone's privacy, and I would never give your email to anyone else. Nevertheless, the law requires that I tell you exactly what happens with your data. And you need to tell me that you agree with it. I use MailChimp to send out the newsletter. When you subscribe to my newsletter, your email address and name is stored with MailChimp. It is an American company certified under the EU-U.S. Privacy Shield, this means, your data is safe. You can unsubscribe from the newsletter anytime, there is a link at the bottom of each email. There is also a link to change your data if you need to. When you click the "subscribe" button below, you declare that you are over 16 and you agree that I may process your information to send the newsletter to you. Please take a minute to tell me what interests you most, you can check more than one box. Knowing what you expect from my newsletter makes it easier for me to write it. Please check your favourite topics! After you sign up, you will receive an email that asks you to confirm your subscription. After all, I want to be sure that you subscribed, and nobody else played a trick on you. A short "thank you" email follows up after you confirmed your subscription, and that's it. The next email will be the real newsletter, and I hope you are going to enjoy it.